Summary: Vicky Decker has perfected the art of hiding in plain sight, quietly navigating the halls of her high school undetected except by her best (and only) friend, Jenna. But when Jenna moves away, Vicky’s isolation becomes unbearable. So she decides to invent a social life by Photoshopping herself into other people’s pictures, posting them on Instagram under the screen name Vicurious. Instantly, she begins to get followers, so she adds herself to more photos from all over the world with all types of people. And as Vicurious’s online followers multiply, Vicky realizes she can make a whole life for herself without ever leaving her bedroom. But the more followers she finds online, the clearer it becomes that there are a lot of people out there who feel like her— #alone and #ignored in real life. To help them, and herself, Vicky must find the courage to face her fear of being “seen,” because only then can she stop living vicariously and truly bring the magic of Vicurious to life. I won a copy of How To Disappear from author Sharon Huss Roat herself in a giveaway, and I was so excited when I found out that I won because this book had been on my TBR for quite some time! As the summary explains, Vicky is a social anxious high school girl whose one friend that she felt comfortable with ends up moving away. In her absence, Vicky feels like she's flailing, and it doesn't take long for her ex-best friend to find a new group of people to hang out with -- people that make her totally unrecognizable and eventually goad her to say some pretty awful things about Vicky, who was supposed to be her best friend for life. 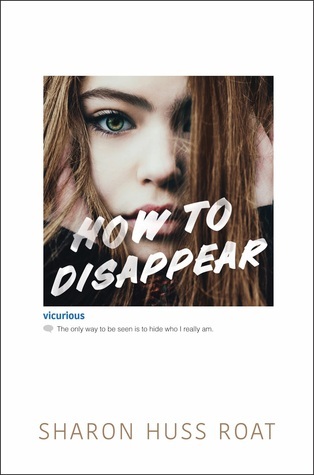 Feeling totally lost and alone in her absence, Vicky turns to creating an online Instagram personality photoshopping herself into some pretty epic pop culture moments as a method of coping and living a crazy life through others. Overall, I absolutely loved this book. The entire story was filled with a lot of things I really enjoy reading about -- coping with mental illness, a secret personality, and even some adorable romance. This book had me hooked from start to finish and even though it was almost 400 pages, I finished it in a little under two days because I just couldn't put it down! (Even though I may have been procrastinating studying for finals...) From the first page until the last page, Sharon Huss Roat created a story that didn't let me go. I kept wanting to find out what would happen next in Vicky's story, which got more complicated and captivating with each turn of the page. It really was that great! My favorite character in the entire book was Lipton. He was so freaking adorable, with his brightly colored socks and quirky comments and his love of Minecraft. I adored him from start to finish -- and I really appreciated how much he went out of his way to care for Vicky and make her feel special and important even when she was feeling anything but. He was a friend that was there for her when nobody else was, even when Jenna left Vicky behind and went on to have new friends and a new life without her. But through it all, even when it may not have made sense why he was being stood up or mistreated or laughed at by other people, he stood by Vicky as a good friend. I found that to be something super admirable and important in a character, and that's what made me love Lipton so much. I also really enjoyed the aspect of having an alternate internet personality that you can feel much freer with than you ever would simply being "yourself." (I mean, now that I think about it, that's basically what I'm doing on this blog -- sitting in my living room writing a review of a book I read, "hiding" behind our brand and feeling much freer and less exposed to speak that way.) It's not a bad thing at all -- but it's certainly a feeling that's very used to get to, that sense of online anonymity. So I was able to sympathize with how quickly Vicky managed to get lost in it. My favorite part of this book was definitely the ending. (Some spoilers ahead, so please skip to the next paragraph if you haven't read this book yet and don't want it ruined for you!) I was not expecting the book to take such a drastic, heart-racing turn, but that's exactly what it did and I absolutely flew through the last chapters of this book because I just kept wanting to know what would happen with Vicky and if Jenna would be found (and if she was found, if she would be found alive). And then what would happen after Vicky came out as Vicurious and Lipton confronted her and everything happened. It all snowballed super fast in a plot twist that I wasn't expecting and it ended up panning out really nicely. If you're thinking about adding this book to your TBR, I highly encourage you to do so. This book tackles so many important topics and delves into multiple facets of the teenage experience and also mental illness and the dangerous of social media fame, which is all stuff that is always really relevant, but definitely moreso now during the social media boom we are all experiencing. Overall, I absolutely loved How To Disappear. It had me hooked from start to finish and it was such an easy read that it gripped me from the beginning and had me hooked up until the very end. I loved all of the drama and the plot twists, as well as seeing Vicky's social anxiety and recognizing part of myself in another character, as someone that struggled with social anxiety like that for a very long time. This book is just filled with so much important, thrilling, gripping material, and I'm so thankful to have had the chance to read it. Like I said, if you're not sure about this book, I absolutely recommend that you take the plunge -- you won't be sorry. Books We Got For Christmas! College Diaries: The semester is over! Author Interview: Sharon Huss Roat!